Andrew Jackson was an American military and political leader and the seventh President of the United States. He was born on March 15, 1767, at Waxhaw, South Carolina. His father died a few days before Jackson was born. His mother and one of his two brothers died later of smallpox, while Jackson's other brother died during the American Revolution. By the time he was fourteen, Jackson had no surviving immediate family. He inherited three hundred dollars from his grandfather and used this money to support himself. Jackson eventually became a lawyer and moved to Nashville, Tennessee, where he established a law practice. He quickly earned a name for himself and became well respected for his legal knowledge. Voters in Tennessee elected Jackson to the United States House of Representatives in 1796. In 1797, he became a United States senator from Tennessee. In 1798, he left the Senate and became a justice on the Tennessee Superior Court. In his free time, Jackson oversaw his plantation, the Hermitage, just north of Nashville. Jackson soon became one of the wealthiest men in all of Tennessee. He owned some of the finest racehorses and had a reputation for gambling and drinking. He also had a hot temper, and fought several duels. During the War of 1812, Andrew Jackson led two thousand men against the Creek nation. The Creeks had allied themselves with the British, hoping that with British assistance, they could stop U.S. expansion westward. Jackson forced the Creeks to cede approximately 23 million acres of land to the United States. 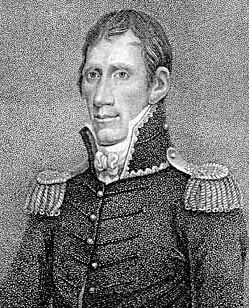 During 1814, Jackson captured Pensacola, Florida, from British soldiers, and in 1815, he successfully defended New Orleans from a British attack. The British had hoped to capture New Orleans so that they could seize the crops and products sent from the then-western states such as Ohio to New Orleans for shipment to the East Coast of the United States. Jackson’s military service continued after the War of 1812. He continued to consolidate U.S. territorial claims against American Indians. In 1815 and again in 1818, Jackson marched against the Seminole tribe in Florida. As a result of his attack in 1818, the Spanish government realized that it could not defend Florida against the United States. In 1819, Spain sold Florida to the United States, and in 1821, President James Monroe appointed Jackson governor of the Florida Territory. Jackson was by now a famous military figure in the United States. Many Westerners appreciated Jackson's efforts against the American Indians. Many U.S. residents remembered Jackson's important contributions during the War of 1812. Working people in the United States also respected Jackson for his efforts in expanding the borders of the United States. Additional land would hopefully drive the cost of land down, allowing struggling U.S. residents more opportunity to become self-sufficient farmers. As a result of his fame, Jackson decided to return to politics. In 1824, he ran for President of the United States against John Quincy Adams, John C. Calhoun, Henry Clay, and William Crawford. Jackson had been a member of the Democratic-Republican Party. By the Election of 1824, the Federalist Party had collapsed. The Democratic-Republican Party was in transition as new parties developed. During the Election of 1824, many candidates, including Jackson, ran under the banner of the Democratic Party. Other candidates, most importantly Adams, ran as National Republicans. The National Republicans closely resembled the Federalist Party, while the Democratic Party was similar to the Democratic-Republicans. Although Jackson won the popular vote in this election, he did not have more than fifty percent of the Electoral College vote. As a result, the House of Representatives determined the next president. The House selected Adams. This was the first time in U.S. history a candidate won the popular vote but did not become president. Jackson immediately began campaigning for the election of 1828. Jackson took his campaign to the people. He argued that Adams had stolen the election from the people. Jackson actively campaigned, holding rallies and giving speeches. Before the Election of 1828, most candidates for President did not actively campaign, thinking it immodest. A candidate relied on his supporters to express why he would make a strong leader. Jackson decided in 1828 to go to the people directly. He argued that he was one of the people, born in a log cabin to a family of working people. He also emphasized his various military successes. As a result of this personal campaign, Jackson won the Election of 1828 relatively easily. Jackson's election ushered in an "Age of Jackson". He was the first man elected president from the West. He also had experienced a rougher upbringing, both financially and socially, than the earlier men who had served as president. Jackson argued that the president was the only person elected by all eligible voters. Senators and congressmen only represented their individual states. Since all voters could select the president, Jackson contended that only the president represented the will of all of the people. He argued that his policies were what were best for the country. Anyone who stood in his way, according to Jackson, had to be destroyed. By the end of Jackson's second term in office, he had changed the federal government forever. While the drafters of the Constitution had hoped for a three-branch government with each branch being relatively equal, Jackson made the presidency the most powerful branch of the United States government. While Jackson claimed to represent the will of all of the voters, some people suffered during his presidential administration. By the end of his term, a number of people in the U.S. had joined the Whig Party, a political party opposed to the Democrats and Andrew Jackson. Most Ohioans initially welcomed Andrew Jackson's election. During his time in office, Jackson continued to force American Indians to forsake their land east of the Mississippi River for land west of the river. Ohio's small farmers and industrial workers believed that land seized from the natives would open up new opportunities. Land prices would hopefully fall, allowing working-class residents the chance to either own or expand their landholdings. Many Ohioans also welcomed Jackson's attack on the Bank of the United States due to the Panic of 1819 and the Banking Crisis of that same year. Jackson succeeded in destroying the National Bank, but new economic problems arose in the late 1830s. To help end the national debt of the United States, Jackson refused to assist states in building transportation systems. He would not allow federal money to be used to build railroads, canals, and turnpikes. During Jackson's term, Ohio was in the midst of a massive canal-building campaign. Ohio farmers and business leaders wanted internal improvements to reduce the cost and time necessary to transport products to their major markets on the East Coast. Jackson's attack on the National Bank also resulted in several banks issuing currency instead of just one. The banks printed too much money, causing high inflation. In 1836, Jackson ordered government officials to no longer accept payment in currency for taxes, land sales, etc. The federal government would only accept gold or silver coin, preventing many in the U.S., including Ohioans, from paying their taxes or being able to purchase government land. Jackson decided not to seek reelection in 1836. He was sixty-nine years old. His beloved wife Rachel had been dead for a number of years and his health was beginning to fail. He retired to the Hermitage and died there on June 8, 1845.